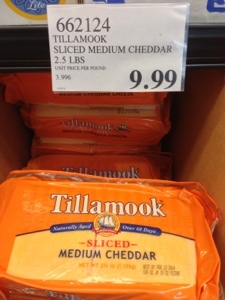 We like the pre-sliced Tillamook medium cheddar cheese at Costco. This is real cheese, not processed cheese product, and convenient enough that any increased cost over block cheddar is worth it. This is a medium cheddar, easy to use in recipes, but for sharp cheddar taste, Costco has better options. Bob takes lunch to work, and the first time I made him lunch, he texted me about a surprise in his sandwich. Unknown to me, the slices come with a paper separator. Bob had eaten half the sandwich before he figured out where the crunch originated. Hey, just a little more roughage. And she included sweet notes in my lunch, too.